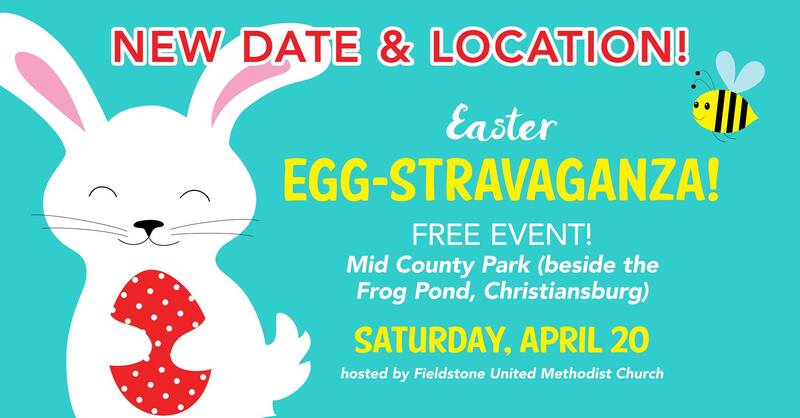 Fieldstone United Methodist Church presents their 2019 Easter Egg-stravaganza Celebration on Saturday, April 20, 2019 at the Mid County Park Shelter in Christiansburg, VA.
Join us for two Easter egg hunts featuring hundreds of eggs! There will be an Easter Egg Hunt for kids 3 and under and a Scavenger Hunt for kids 4 to 12 years old. Mid County Park is located at 390 Cinnabar Road in Christiansburg, VA near the Frog Pond. Note: The event was originally scheduled for Sunday, April 14, 2019, but had to be rescheduled due to weather. To view the event flyer, visit: https://i.imgur.com/q1d8sa3.jpg. For more information, visit: http://www.fieldstoneumc.org/ or https://www.facebook.com/fieldstoneumc/ or https://www.facebook.com/events/2024364387864736/.